SOLAR POWERED - Rechargeable AAA Battery Include,Turn it on,Light Sensor Control Auto On/Off - Charge under Sunshine on Daytime and Turn on Automatically at Night or Dark Environment,Charge 6-8h will Light Up 8-12h.Of Course,You Can Also Use Regular AA Battery as a Back-up if it's not a Sunny Day. EASY OPERATE - Contains 4 Silver Srew Lids with Built-in Solar Powered Firely Style LED String Lights (10 LED Lights Per String),Welcome Guide and Spared USB Battery Charger Include.Mason Jars Not Included. 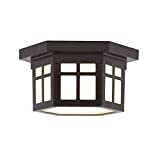 POPULAR APPLICATION - This Mason Jar Lights Screw Lid Diameter Size: Lid 2.76""(70mm)/Insert 2.17""(55mm). Suit for Any Regular Mouth Mason Jars,Like all Major Brands: Ball,Kerr,Golden Harvest,Kilner and Generic Mason Jars. FAIRY WARM WHITE LIGHTS - Perfect for any Occasion,Very Popular Mason Jar Solar Lanterns Make Warm and Charming Atmosphere Mode for Your Garden, Patio, Lawn, Christmas, Pary, Wedding, Receptions,Formal Events & BBQ,Garden,Pathways,Ponds,Sun Rooms,Benches,Dressers,Tables,Bookshelves or Window Sills Decoration Lighting. 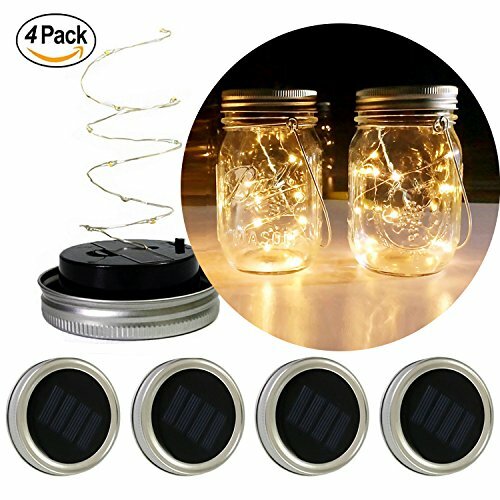 Creative design mason jar solar string lights screw lids. 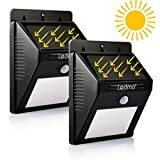 (1pc AAA Rechargeable & Replaceable Battery Include) Perfect for solar pathway lighting, garden/patio/lawn pendant decor lighting, solar garden lighting, and creating a perfect summer ambiance in your patio. 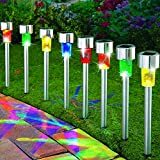 Decorate a garden party, or wedding with a summer feel, this solar mason jar lights Lids brings the perfect mood to your gathering.With built in light sensor, the string lights lids can be automatically turns on at night or in dark. Please be note,each light lid also includes an On/Off switch underneath the lid. Easy to postion for any location as they not require electricity, just simple sunlight to charge. Each solar mason jar lid includes a water-resistant solar cell, a rechargeable battery, and warm bright 10 LEDs string lights.